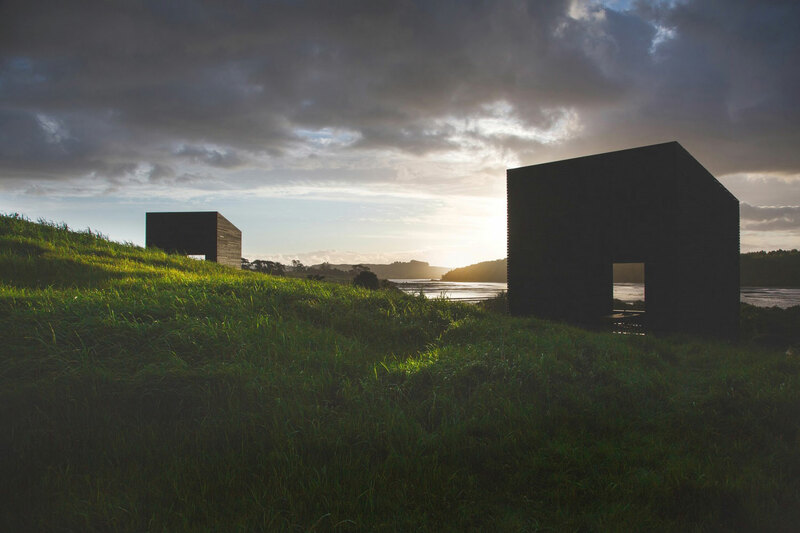 Two modest cabins sit at the foothills of an estuary in Kaiwaka, New Zealand. 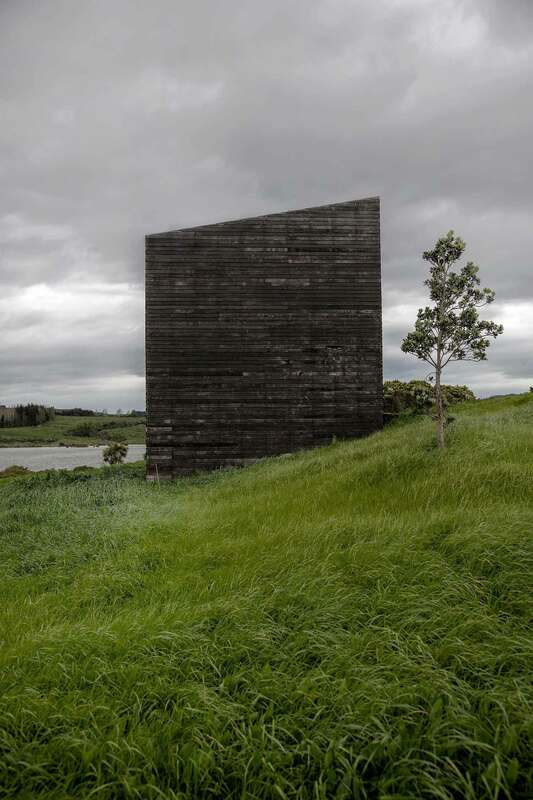 Their charred timber skins contrast with the surrounding landscape like a pair of stray boats floating in a sea of swaying grass. 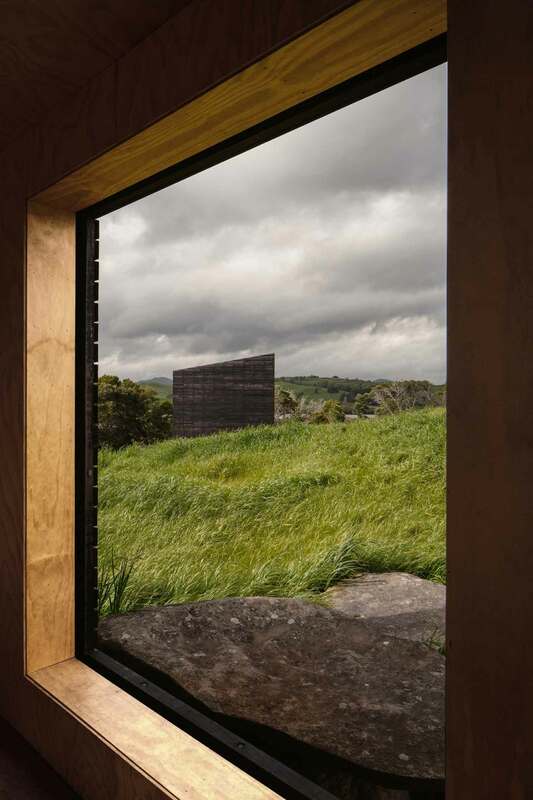 Isolated and unconventional, the Eyrie Cabins are the work of Auckland studio, Cheshire Architects who have envisioned an alternative to the large and lavish holiday homes that have become a luxury in New Zealand. 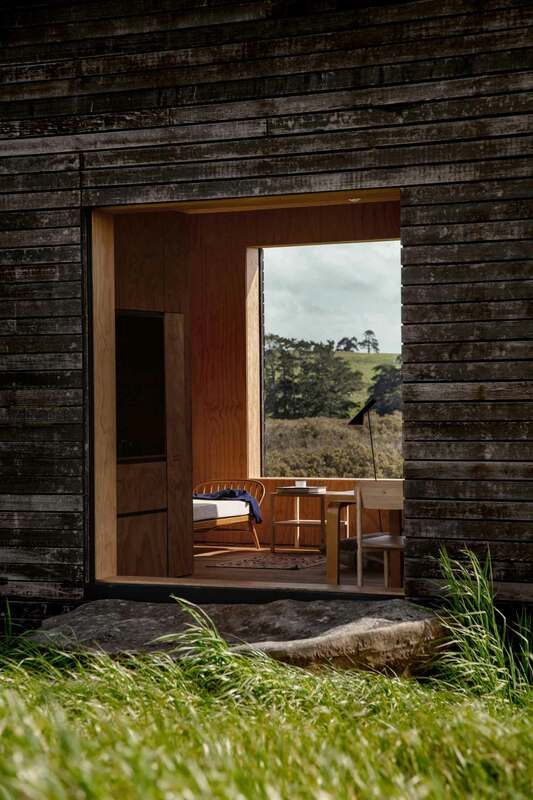 The result is a low-budget scheme that feels incredibly robust and highly liveable. 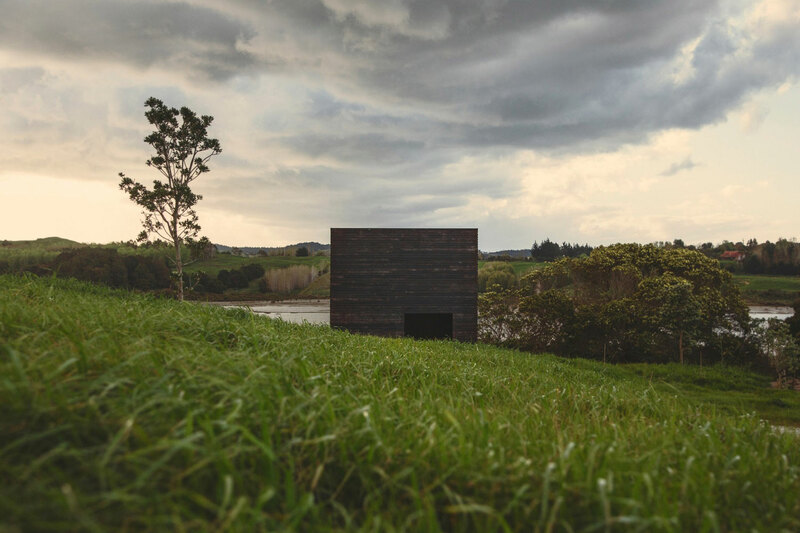 They are a testament that retreats need not be huge or copious to offer a peaceful and satisfying hideaway. 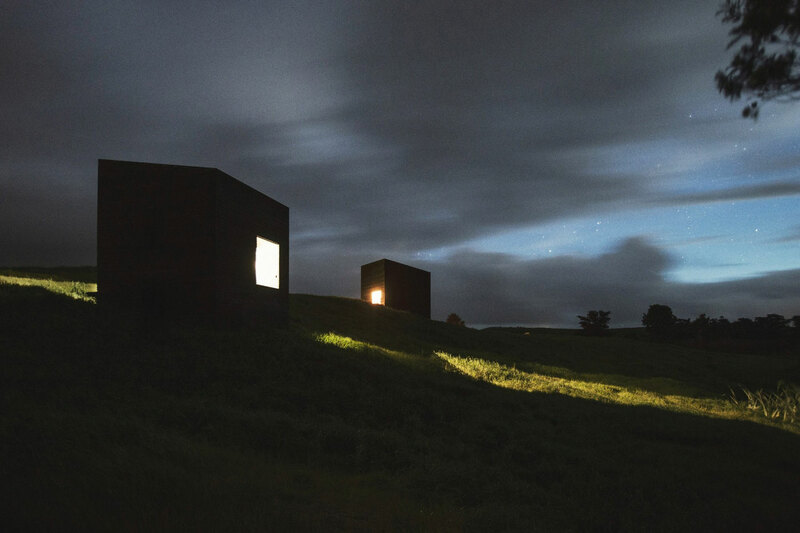 The cabins are located on a sloping site and are surrounded by the dips and folds of the hillside which shelter them from the wind. 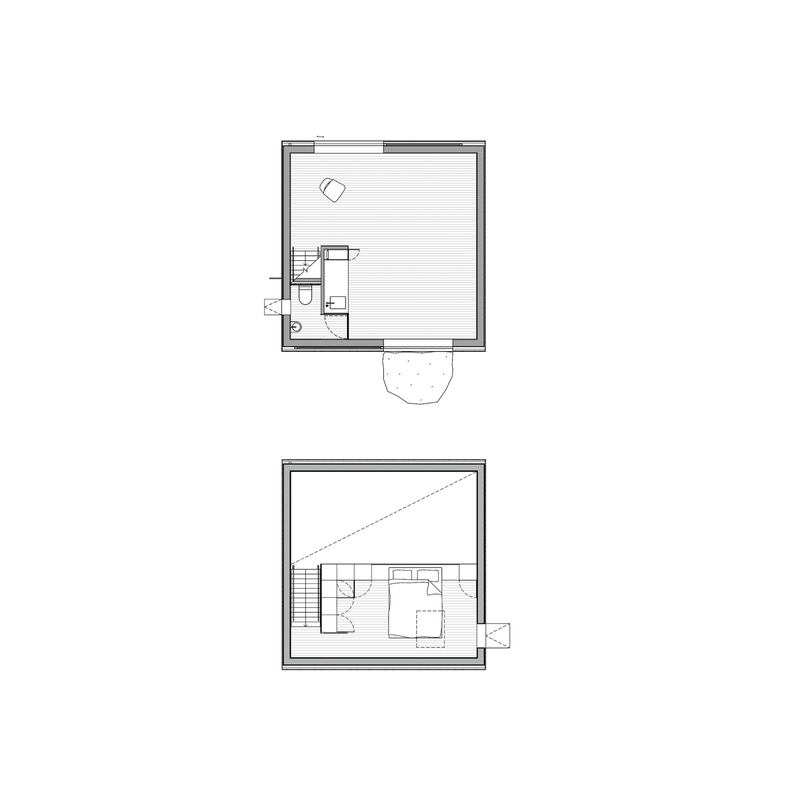 The vast land size could easily fit a 1500sqm manor but instead accommodates two 29sqm forms. The cabins are totally off the grid but are equipped with necessities. 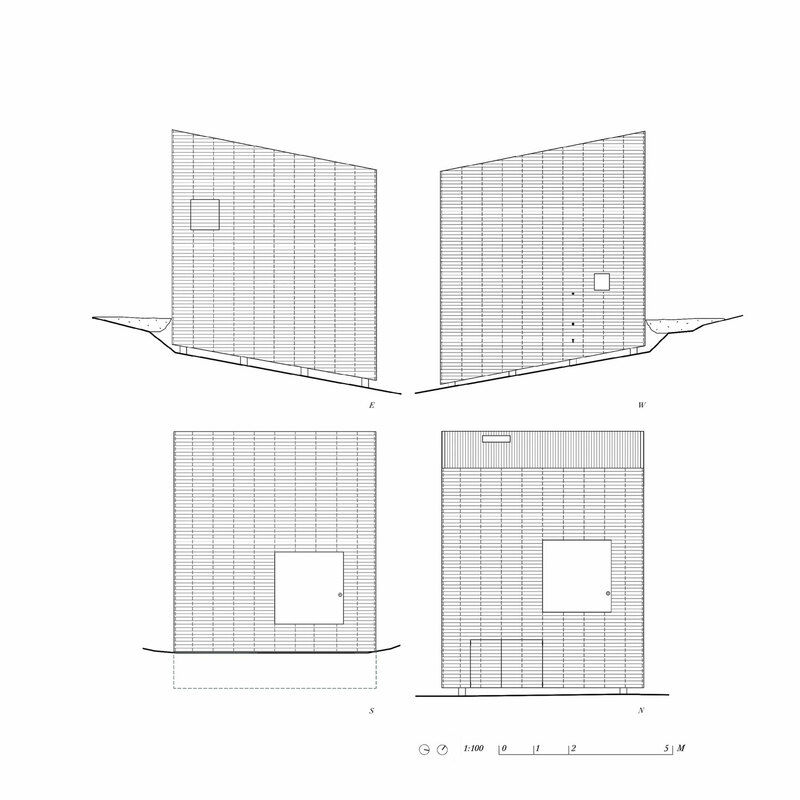 They each have a bathroom, kitchen, living space, bedroom and outdoor shower. There are no paths or designated routes leading towards them, instead a boulder becomes your welcome mat and a drop down window covering becomes a ramp for you to ascend. 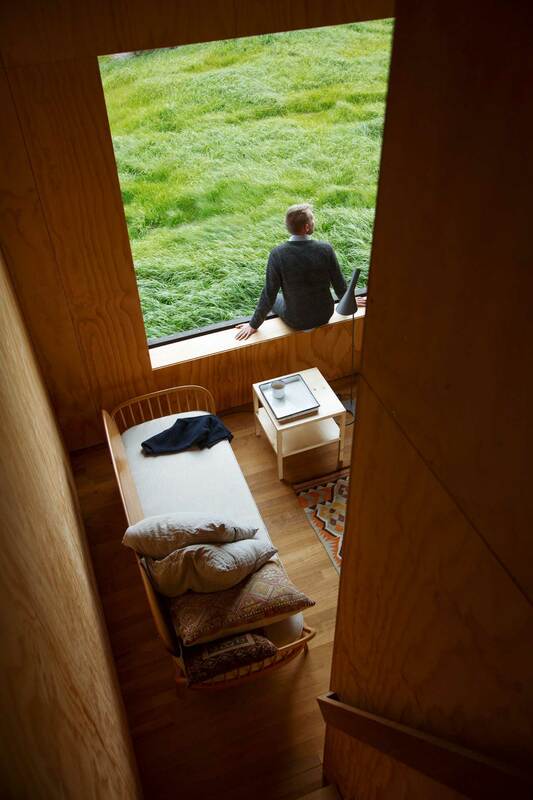 Talk about a room with a view. 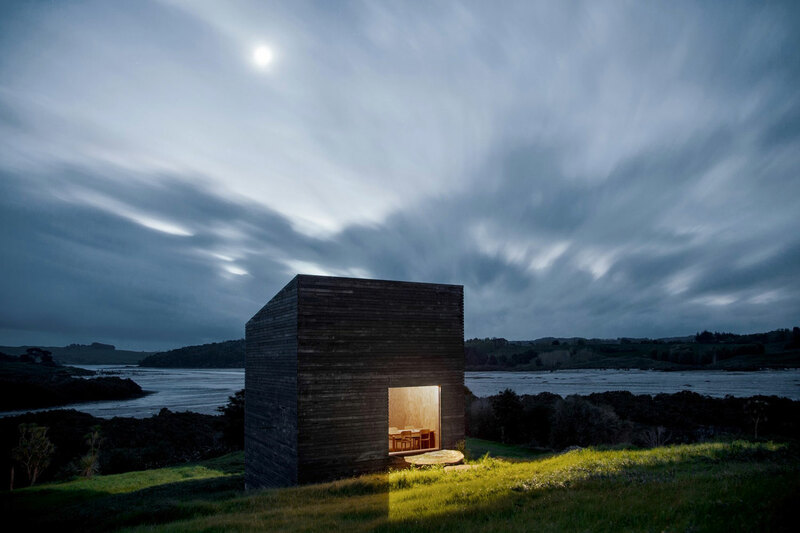 The framing of nature and the functional openings of these dwellings were highly considered and both cabins are oriented to the best views. 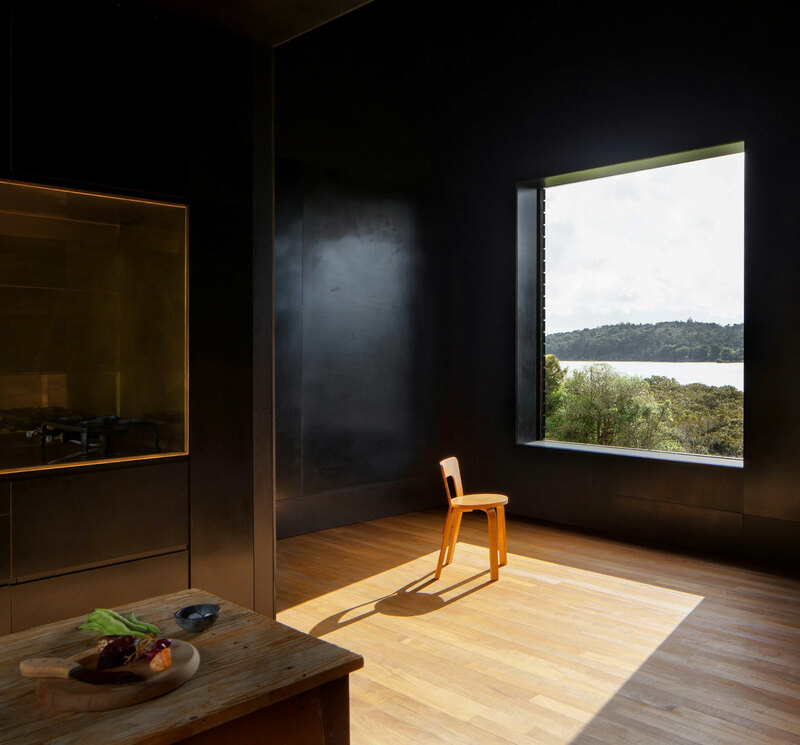 Wood hatches allow for ventilation and windows are framed towards the estuary below. 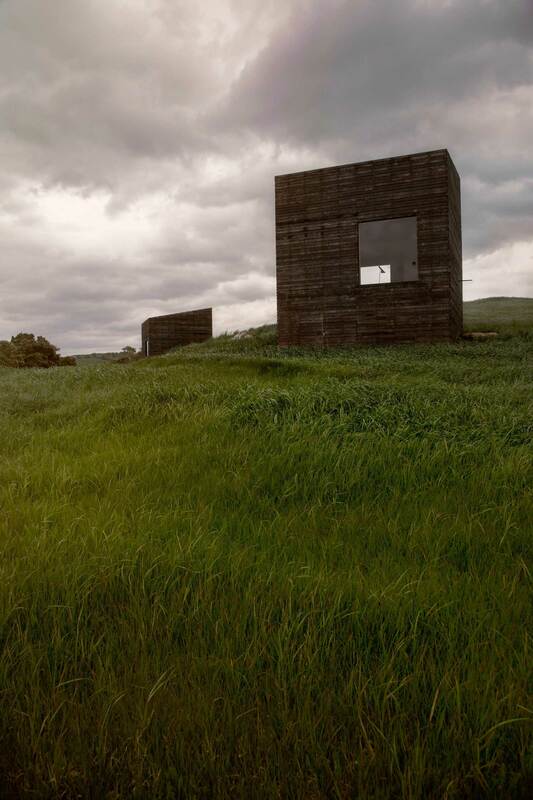 There is a heightened sense of solitude as each cabin is hidden from the other due to clever window placement. 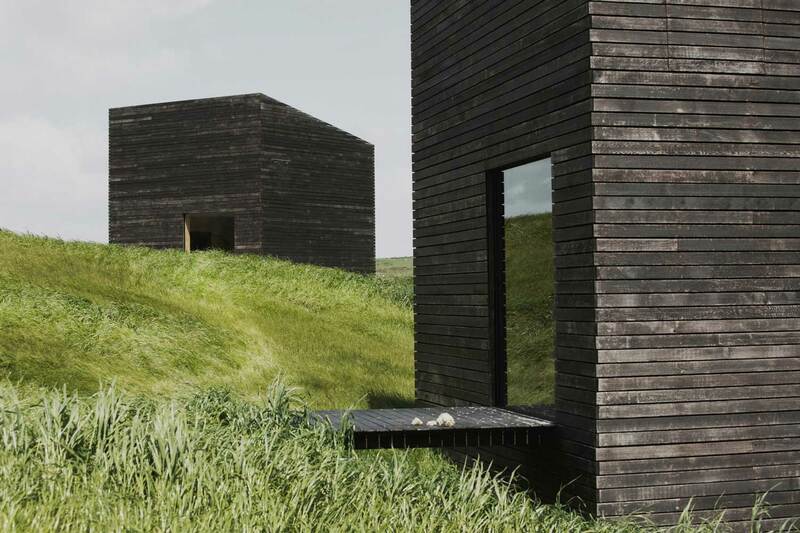 Designed for two different clients, the cabins are programmatically the same but contrast wildly inside. Yin and Yang in nature, one is light the other dark. 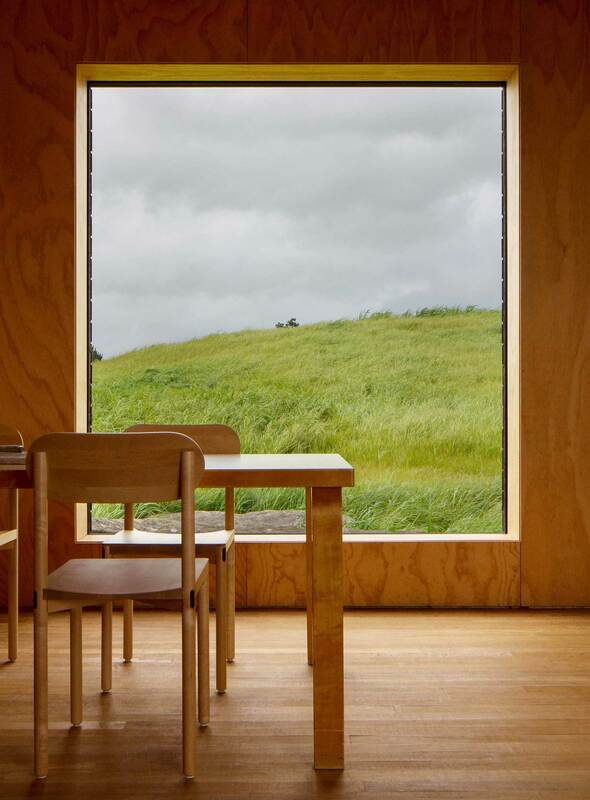 In the former, light builder’s plywood is coupled with refined and minimal timber furnishings. 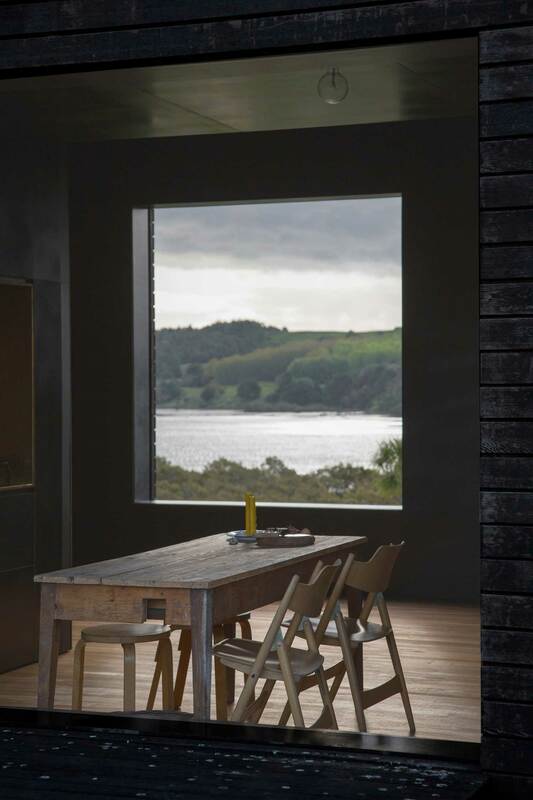 The other is lined in polished black plywood boards that create a deep, inky space that you could easily melt into. 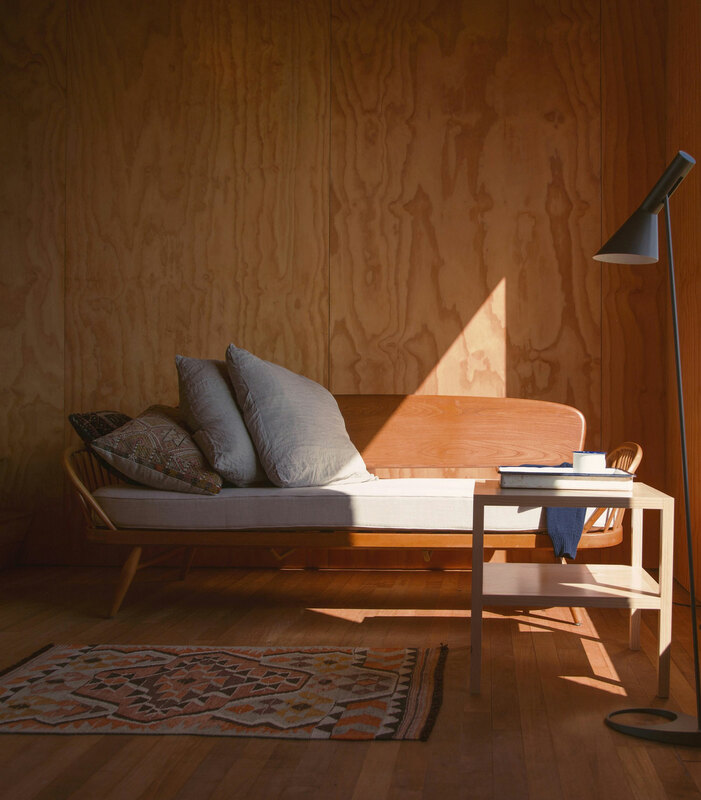 Each owner has added luxurious details to their retreats adorning them with stunning pieces by Arne Jacobsen, Donald Judd and Ercol. 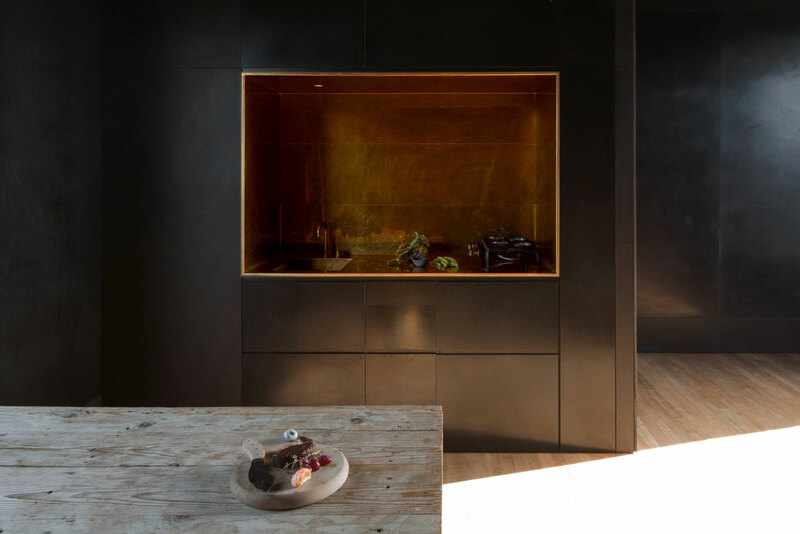 The kitchen nooks are a design marvel and are wrapped in contrasting materials of oiled jarrah eucalyptus wood or glamorous brass panelling. 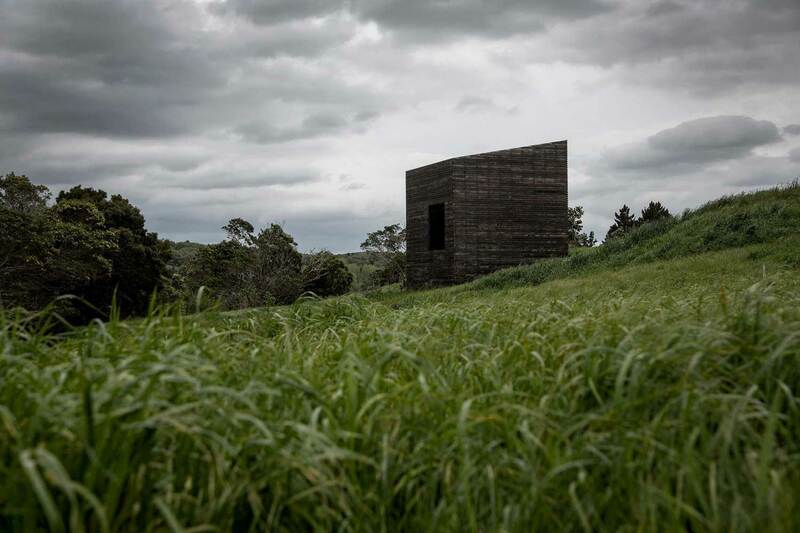 Eyrie Cabins form a strong polemic for change. 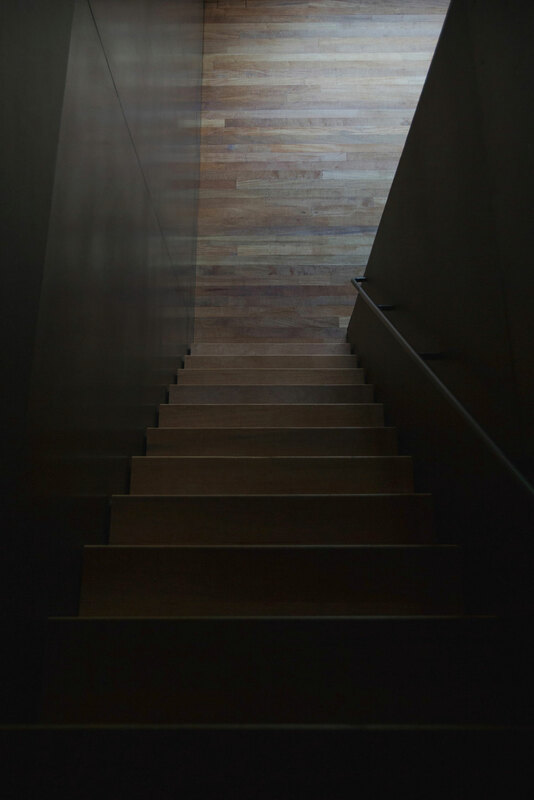 They signal a departure from the rarely used vacation home or the ostentatious and grandiose house. Cheshire Architects urge us to consider what the future for our coastal environments should be. These bite-sized beauties demonstrate that you can be rebelliously small but fundamentally functional and fitting within your environment. #Slowlife by Chompoo Baritone: The Truth Behind Picturesque Instagram Posts.